An 18-year-old whose brother opposed Syria's regime is believed to be the first woman to die in custody in Syria, Amnesty International says. They had been called to the military hospital to pick up her brother's body three days after his arrest. According to the London-based human rights group, the 18-year-old's body had been decapitated, the arms cut off and the skin removed. "If it is confirmed that Zainab was in custody when she died, this would be one of the most disturbing cases of a death in detention we have seen so far," said Philip Luther, Amnesty's deputy director for the Middle East and North Africa. The case emerged as the office of the UN human rights chief warned that the Syrian government's crackdown also appeared to be targeting activists outside the country. "Prominent human rights defenders, inside and outside the country, are reported to have been targeted," spokesperson Ravina Shamdasani said. She gave no further details of the attacks but said the reports were significant enough to raise alarm. More than 2,700 people have been killed in Syria's crackdown, the UN says. 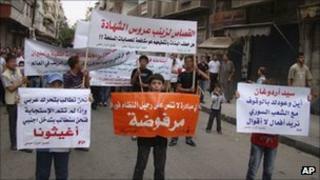 Reports said there was more violence after Friday prayers in Homs. Events from Syria are hard to verify as international journalists have been largely prevented from reporting there. Reuters news agency quoted activists as saying that security forces fired on pro-democracy protesters after Friday prayers, killing nine people in Homs province. Two others were shot dead in suburbs of the capital, Damascus, they said. The violence has drawn widespread condemnation. US President Barack Obama urged the UN Security Council to sanction the Syrian regime. The Syrian government has blamed the violence on "terrorists" and "armed gangs", but has become increasingly isolated. The EU and the US have both imposed sanctions on Syria's regime. EU countries have been trying to tighten them, with stricter measures due to take effect on Saturday if approved by all 27 member states.